Gay.com: The Presbyterian Church (U.S.A.), bitterly divided over sexuality and the Bible, set up another confrontation Friday over its ban on ordaining noncelibate gay men and lesbians. Did Al Sharpton Just Out Anderson Cooper? Reuters: The openly gay U.S. Episcopal bishop at the center of the Anglican church’s global battle over homosexuality, has entered into a civil union with his longtime partner at a private ceremony. About 120 guests gathered at St. Paul’s Church in New Hampshire for Saturday’s ceremony for Bishop Gene Robinson and his partner of more than 19 years, Mark Andrew. The event was kept private out of respect for next month’s worldwide Anglican conference, Robinson’s spokesman, Mike Barwell, said on Sunday. 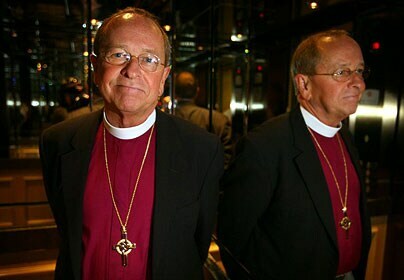 Telegraph: Bishop Gene Robinson, the first openly homosexual Anglican bishop, is about to “marry” his partner, further inflaming tensions in the church ahead of a series of critical meetings this summer. The bishop, whose appointment has driven the worldwide church to the brink of collapse, is to have a civil union with his partner of 20 years, Mark Andrew. They will have a private ceremony carried out by a lawyer in front of family and friends on Saturday, followed by a service of celebration in a church nearby in New Hampshire, northeast USA.